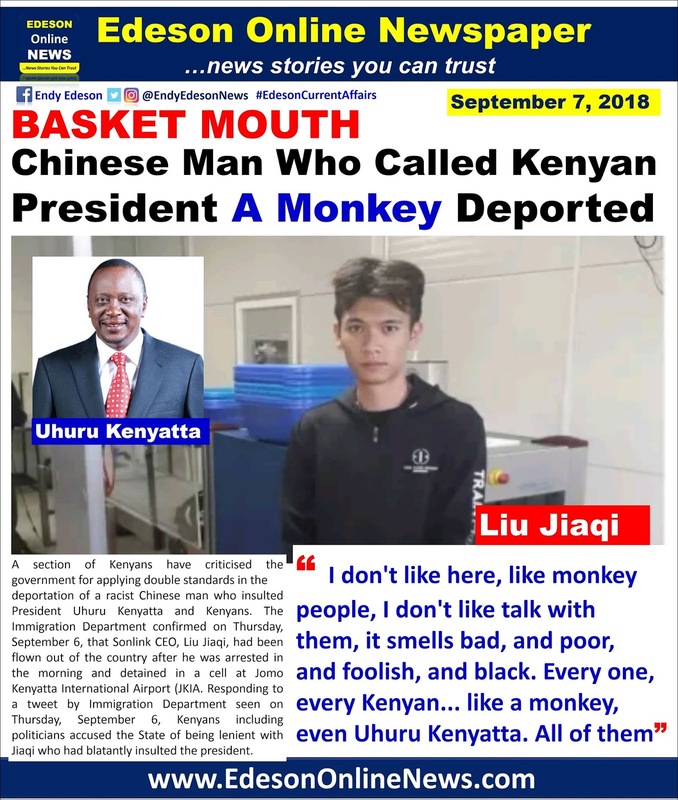 A section of Kenyans have criticised the government for applying double standards in the deportation of a racist Chinese man who insulted President Uhuru Kenyatta and Kenyans. The Immigration Department confirmed on Thursday, September 6, that Sonlink CEO, Liu Jiaqi, had been flown out of the country after he was arrested in the morning and detained in a cell at Jomo Kenyatta International Airport (JKIA. Responding to a tweet by Immigration Department seen on Thursday, September 6, Kenyans including politicians accused the State of being lenient with Jiaqi who had blatantly insulted the president. infamous Animal Farm novel by George Orwell where some animals were more equal than others. "Animal Farm loading. He probably travelled business class. An ordinary Kenyan would have been arrested by Jean-Claude Bazooka wielding cops, with teargas wielding APs in tow," Kilonzo tweeted. FORD Kenya party leader Moses Wetang'ula challenged Uhuru to hit back to Jiaqi just like US President Donald Trump viciously responded to a tweet in which he was called a mad man. @Luc; You mean, Nigeria won't deport him? In Nigeria he is going no where.